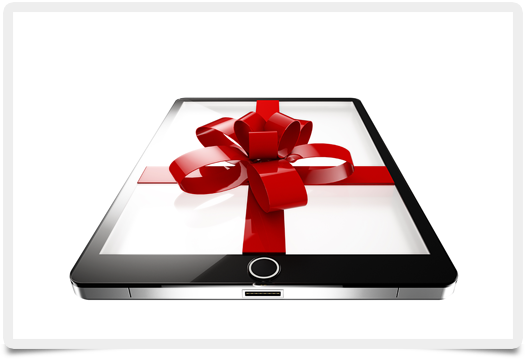 With the Holiday season rapidly approaching, is there a tablet computer on your gift list? Either for friends and family — or even yourself — tablets are perfect for surfing the web and enjoying streaming media like movies and music. They are a great way to the get the most out of your high speed Internet connection. With that in mind, here is a quick glance at three top notch tablets sure to find their way onto shopping lists for the Holidays. Trying to fight off its tablet market share lead against a wide variety of Android tablets, the iPad Air 2 definitely raises the bar for Apple. It is the flagship of Cupertino’s updated tablet collection, which also includes a new model of the iPad Mini. The Air 2 sports the fastest processor, sharpest display, and best camera of the iPad line to date. If you choose to go with an iPad Air 2, a variety of models exist with on-board storage that varies from 16 GB to 128 GB in three different colors (silver, grey, and gold). Connectivity options include both WiFi or a combination of WiFi and Cellular service which works great when on the go. Prices for the iPad Air 2 start at $499. If you already enjoy Amazon Prime and its free shipping and video streaming features, the Amazon Kindle Fire HDX 8.9 makes a perfect tablet option. In fact, CNET called the tablet the “standard for media consumption.” Still, some users may prefer the larger, sharper Retina display on the new iPad. The Kindle Fire HDX also comes with a convenient Mayday feature which offers customer support at a simple finger tap — a boon for newer tablet users. At a price of $349, the unit is also cheaper than many similar tablet computers, but only includes 16 GB of storage. If you plan on doing a lot of Amazon Prime video streaming on the Fire HDX, be sure to regularly check your bandwidth with an Internet speed test. Samsung’s Galaxy Tab series ranks near the top in the world of Android tablets. The Galaxy Tab S fits a powerful processor and sharp 8.4-inch display into a thin, lightweight package. The latest version of Android KitKat comes installed, and Android Lollipop is expected to also run smoothly on the tablet once the new OS is fully released. If you are considering an iPad Mini, the Galaxy Tab S is worth checking out, especially if your primary uses for the tablet involve web surfing and media streaming. Still, the $374 price point for the Samsung tablet is similar to the iPad Mini, making the choice more difficult. Ultimately, the final decision may come down to your preference of iOS versus Android. These top three tablets are all worthy purchases, sure to make a quality gift for someone — including you — for this Holiday season!